It seems so strange to think that today, Tom Cruise is 50 years old. Biologically he has reached a half-century mark, but he still has a remarkably youthful appearance. Yes, he doesn't look like a twenty-year-old in the Top Gun/Risky Business mode, but he certainly doesn't look like a man well into middle age. I think there is something to be said for his incredible work ethic. If it requires him to maintain a rigorous physical regimen, he will do so. If it requires to go all out in terms of a performance, he will. Yet for all the good performances Tom Cruise has given, even in pure popcorn fare like Tom Gun or perhaps Cocktail, and for his three Oscar nominations (Best Actor for Born on the Fourth of July and Jerry Maguire, Best Supporting Actor for Magnolia), Cruise has been far too often dismissed as an actor. I can't understand why. His career has been one where he's had more hits than misses, and one certainly unafraid to tackle roles he wouldn't be thought suitable for. Anne Rice was highly critical of Cruise's casting as her iconic vampire Lestat in Interview With the Vampire, but the proof is in the pudding. He gave a very solid performance of this seductive vampire. Look at some of his other dramatic turns. He managed to hold his own against Paul Newman in The Color of Money, Dustin Hoffman in Rain Man, and Jack Nicholson in A Few Good Men. One can quote Nicholson's "You can't HANDLE the truth," but who was it that wanted the truth? The man has done much to stretch beyond his image of the cocky kid with the easy grin. At times he's failed spectacularly (Vanilla Sky, Eyes Wide Shut, Lions for Lambs), but give him credit for this: Tom Cruise has certainly tried new things, and even in the failures he shows he's willing to venture into new realms and stretch as an actor (and no, that was not a short joke--given we're the same height, I don't take shots at glass houses). Still, the man I don't think has been seen as anything other than someone who has gotten by on his looks. I would argue that in most of his performances from The Firm to Minority Report and Valkyrie (where I have long argued he didn't need a German accent), Tom Cruise gave dynamic performances that from other actors would have earned praise. 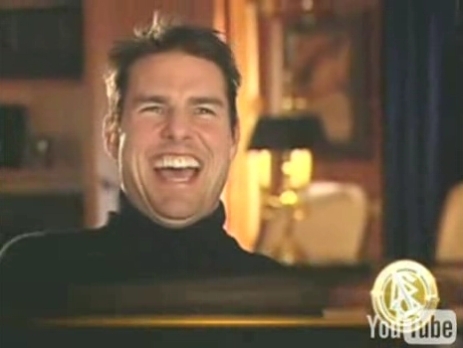 The Tom Cruise persona appears to be one that is slightly smug, self-assured but no real depth to him. Granted, Cruise has done himself no favors by his remarkably odd behavior. His mad (in an almost literal sense) protestations of love for Katie Holmes (who was a mere sixteen years younger) solidified the idea that on a certain level Tom Cruise was just flat-out bonkers. I often have wondered if Cruise is so isolated from the rest of us that he didn't appreciate just how bizarre his antics were. Having seen his infamous "jump the couch" moment (YouTube will never let things die), I thought it was all rather sad. This is a man in his FORTIES behaving worse than a teenager over having a new girlfriend (who was almost a teenager herself). There was something manic, almost unhinged at his glee every time Oprah Winfrey mentioned Katie Holmes' name. By any standards, the entire spectacle was weird, if not downright insane. You had the infamous "jumping the couch" moment. You had his on-screen fight with Matt Lauer over psychology. You had him publicly criticizing Brooke Shields for daring to make her own medical decisions rather than consulting him on the matter. The nadir of the "Tom Cruise is NUTS" revolves around the subject of his faith. Let's be frank, Scientology is controversial to say the least. It is not recognized as a religion in Germany, with officials so alarmed by it that some officials have sought to ban it. As to whether it is a religion or not I cannot say. 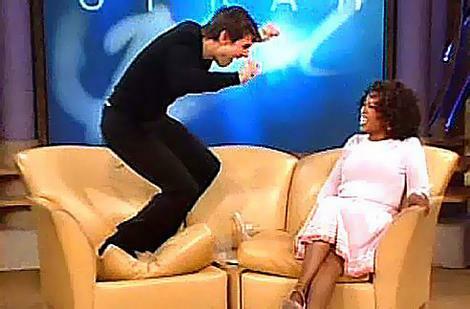 What one can say is that Tom Cruise is an enthusiastic proselytizer for his faith in/of Scientology. What he does for spiritual sustenance is his own affair. However, the leaked video of his promotion of Scientology to his own faithful at times seems rather bizarre, with his ideas that only Scientologists (such as himself) were the only ones who could help in crises and are the authorities to bringing peace and unite cultures. Someone send Jenna Elfman and Giovanni Ribisi to Syria, STAT! At the very least, it smacks of smugness and self-absorption (there are such people as paramedics and "good Samaritans" who don't subscribe to the Scientology belief system). I leave it up to you what the worse aspect of his enthusiasm for Scientology. The Scientology aspect to Cruise is not good for him only in that it distracts from his actual abilities on screen. I think the public still thinks well of Cruise as an actor, but his antics have done harm to his brand. Mission: Impossible: Ghost Protocol was well-received and a huge hit, so the idea that people don't turn out for his films because of his passion for Scientology doesn't hold. I digress to say I didn't see Ghost Protocol only because I so hated the first Mission: Impossible I swore never to see any other Mission: Impossible movies and have kept my pledge. The fact that Tom Cruise bombed in Rock Of Ages I think has less to do with him than with the film itself. Again, I have yet to see Rock Of Ages, but it does sound a little like Burlesque. In short (no pun intended) I think Tom Cruise is a competent, perhaps highly talented actor. I think he will win an Oscar, if only a Lifetime Achievement one. He is highly skilled but one who has allowed his off-screen theatrics to at times cloud over a remarkably solid career. I hope he continues taking risks, not just physical ones like those in the Mission: Impossible films but career-wise. He has done so: taking on a musical, being in on the joke in Tropic Thunder, (which disproves the man has no sense of humor) so perhaps in the next ten to twenty years (a man in his seventies hanging on to a cliff by his fingers would be more alarming than thrilling in my estimation) he may yet earn the respect his career and talent would give him. With that, I wish a Happy 50th (!) Birthday to Thomas Cruise Mapother IV.